1. What is cockfighting? Cockfighting is a centuries-old blood sport in which two or more specially bred birds, known as gamecocks, are placed in an enclosed pit to fight, for the primary purposes of gambling and entertainment. A typical cockfight can last anywhere from several minutes to more than half an hour and usually results in the death of one or both birds. 2. How does it cause animal suffering?Even birds who aren't killed during cockfights suffer terribly. Regardless of how exhausted or injured they become (common injuries include punctured lungs, broken bones, and pierced eyes), the birds cannot escape from the fighting pit. The razor-sharp steel blades or "gaffs" (which resemble 3-inch-long, curved ice picks) tied to the birds' legs are so sharp and dangerous that cockfighters themselves have been killed when accidentally slashed by their own birds. 3. Are there other concerns?Yes. Law enforcement raids across the country have revealed several disturbing facets of this so-called sport. Gambling is the norm at cockfights. Thousands of dollars can exchange hands as spectators and animal owners wager large sums on their favorite birds. The owners of birds who win the most fights in a derby (a series of cockfights) may win tens of thousands of dollars of presumably unreported income. Firearms and other weapons are common at cockfights, mainly because of the large amounts of cash present. In addition, cockfighting has been connected to other kinds of violence: newspaper reports of cockfighting-related homicide are not uncommon. Law enforcement officials have documented a strong connection between cockfighting and the distribution of illegal drugs. Drug enforcement agents often learn about animal fighting operations as a result of narcotics investigations. The presence of young children at cockfights is an especially disturbing element. Exposure to such brutality can promote insensitivity toward animal suffering and enthusiasm for violence. 4. Aren't these birds natural fighters?While it is true that birds will fight over food, territory, or mates, such fights are generally only to establish dominance within a group (the pecking order) and seldom result in serious injury. This natural behavior is quite different from what happens in staged cockfights, where pairs of birds, bred for maximum aggression (and sometimes given steroids or other drugs to make them more successful fighters), are forced to fight until a winner is declared. 5. Isn't cockfighting part of our heritage?While it is true that cockfighting has been practiced for centuries in various countries, including the United States, "old" does not necessarily mean right or even acceptable. At one time the United States allowed slavery, lacked child abuse laws, and refused women the right to vote. 6. Is there a trend toward treating the crime of cockfighting more seriously?Yes. It is illegal in every state, and most states specifically prohibit anyone from being a spectator at a cockfight. 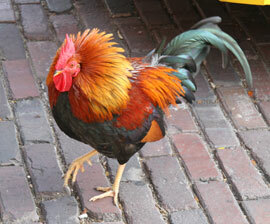 As of 2011, 39 states have passed felony cockfighting laws. In addition, the federal Animal Welfare Act prohibits the interstate transport of any animal that is to be used in an animal fighting venture. We encourage prosecutors to indict those involved in cockfighting not only on illegal gaming charges, but also for conspiracy to commit a crime and illegal gambling. 7. What can I do to help stop cockfighting?If you live in one of the states where cockfighting is still only a misdemeanor, please write to your state legislators and urge them to make it a felony offense. We encourage you also to write letters to the media to increase public awareness of the dangers of cockfighting and to law enforcement officials to urge them to take the issue seriously. You may also want to download and display our anti-cockfighting posters offering a $5,000 reward [PDF] in your community. If you suspect that cockfighting is going on in your own neighborhood, alert your local law enforcement agency and urge agency officials to contact The HSUS for practical tools, advice and assistance.